Brumbies coach Stephen Larkham has labelled next weekend's clash with the Crusaders "massive" and admits finishing in the top two is crucial to his side's Super Rugby title hopes. ACT leapfrogged the Waratahs into top spot in the Australian conference with a bonus point 33-20 win over the Western Force at nib Stadium on Friday night. The victory, which sealed the Brumbies' finals spot, also has the Canberra club in the calculations to finish in the top two and claim a home semi-final. Larkham pointed to the challenges of the club's 2013 campaign, in which they lost to the Chiefs in the final after qualifying third. "If you finish third, there's a fair bit of travel," Larkham said. "We really need a good performance next week to give ourselves the best chance of getting in the top two.. We've known from the last couple of years you can't rest here and you can't just get to the finals and say that's a good season, we really need a top two finish. Next week is going to be a massive game for us." The Hurricanes have already secured the top spot, but the Brumbies are among four clubs battling for the second position along with the Stormers, Waratahs and Chiefs. Larkham said the Brumbies had come through "unscathed" against the Force, but there was some concern over winger Henry Speight, who rolled his ankle early but played out the first half. "I think he'll be fine," Larkham said. "The fact that he can play 40 minutes means it's not that bad but we'll certainly be getting on top of that as soon as possible." 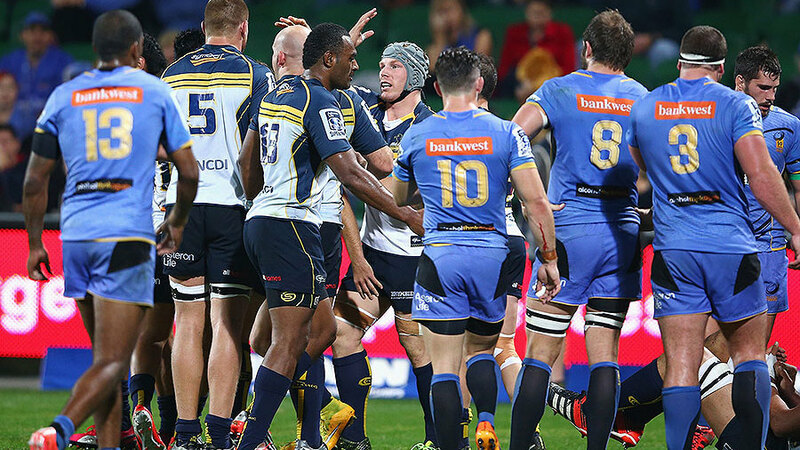 Force coach Michael Foley praised the Brumbies' maul, which he said was the difference. "The Brumbies are a tough side to play at any stage, coming into this period of the season where they are chasing finals," he said. "We'd identified a couple of things that we thought they were strong at, like the maul, and that ended up being the point of difference." It was a difficult night for the Force, who appeared to be cursed by errors when in dangerous positions in attack, before two late consolation tries. "There's two things there: one, the Brumbies are one of the better defensive sides in the competition. They create a lot of line speed and a lot of pressure," Foley said. "The other is with the season we've had, we're desperate, guys are busting their backsides to make things happen and from time to time you might force a pass or drop a ball."